Welcome to our Eco-friendly endodontic practice. North Bethesda Endodontics’ ambiance is designed with our patients' comfort and health in mind. North Bethesda Endodontics provides the finest quality of endodontic diagnosis and treatment using the most advanced technology available together with the highest personal care for our patients and referring dentists. 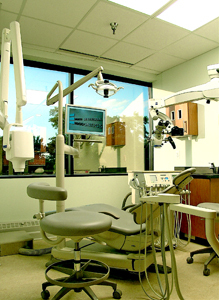 Endodontics is one of the dental specialties recognized by the American Dental Association. We are root canal specialists trained in the diagnosis and treatment of endodontic conditions. Your comfort and trust are of utmost importance to us, thus at North Bethesda Endodontics, your endodontic therapy will be a painless and anxiety free experience. North Bethesda Endodontics has the most technologically advanced equipment including digital surgical operating microscope to better visualize your treatment needs, digital radiography which significantly reduces your exposure to radiation and help in diagnoses and treatment plan review, and our eco-friendly “paperless” electronic practice management system allows you to register on-line at your convenience. "I was extremely anxious when I found out recently that I needed a root canal in one of my molar teeth. Even though I never had a root canal before, I have heard so many times how incredibly painful the procedure is! I actually tried to convince my dentist that I should just remove the tooth! He recommended Dr. Jafari. I barely slept the night before the appointment. I was pleasantly surprised to see how nice and dare I say, relaxing his office was! His staff is really nice and professional. I cannot believe I lost sleep over it. Dr. Jafari did an excellent job. Absolutely no pain! Even after the numbing wore off a couple of hours later, I was pain free. I went straight from my appointment to work. I highly recommend Dr. Jafari, I am sure glad my dentist did!" "In today's healthcare arena, when you find an outstanding oral health provider, you have found a gold mine. Finding someone who has exquisite scientific and clinical skills combined with patient-centered care can be very difficult. It's not usual mixture in today's environment. When I met Dr. Jafari and his staff, I found what I needed but far more. With the need for root canal re-treatment in an emergency situation, I stumbled across a superb clinician whose scientific and clinical skills were one of the best I have encountered in my nearly 2 decades of leadership in clinical and medical research executive service. Yet Dr. Jafari's expertise went beyond that. Calling me every day to make sure I was "ok" was an experience I would never have expected in today's business model of healthcare and dentistry. He made sure I was involved in every step of every procedure. He explained every technical move and did so keeping me as patient calm yet fully informed. But most of all, the man cares. He cares about the person who is entrusted to him. His staff cares also. This is not your usual experience these days. While I hope not to need his services very often (or not at all), if I am in need - I know right where to stumble: again, and again, and again. So will you! 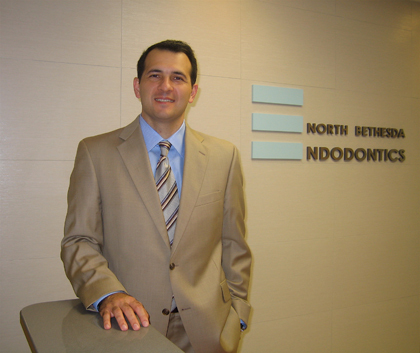 Believe me, North Bethesda Endodontics is the place you need to go when you have to go with your needs!" "Prior to coming to Dr. Jafari, I had several root canals, all of which involved some degree of pain, either during the procedure or afterward. My recent experience with Dr. Jafari was the first entirely pain free root canal, both during and after. In fact, even the novocain shot was only mildly uncomfortable. I have and will continue to recommend him. The care was excellent." "After having to go through a root canal treatment years ago that was done by a dentist in a very fast, painful and lousy manner, even leaving behind a broken piece of metal of an instrument in my root canal, I was now in pain again and in need of a root canal re-treatment. Getting the recommendation for Dr.Jafari's office I of course showed up scared of the upcoming procedure. His staff was extremely friendly, caring and made me feel comfortable. Dr.Jafari took his time, explained every step of every procedure patiently to me, kept me fully informed about every single technical move and most of all, I realized that he cared for me as his patient and I felt good and calm. I did not experience any pain nor discomfort during the procedure. The days after the treatment Dr. Jafari called me to make sure that I was "ok". I am very grateful for the outstanding services Dr.Jafari and his staff have provided to me and I will wholeheartedly recommend Dr.Jafari to everybody who needs root canal treatment." " I recently discovered Dr. Jafari when I learned that I needed to undergo a root canal for one of my molars. I had a lot of anxiety at first about which doctor I should go to, but was very fortunate to have found exactly the right one. Dr. Jafari made my experience absolutely painless and was very thorough in his assessment of the situation. He was so professional and took such time to explain in precise detail the entire process and what the possible outcomes were, that I felt a great sense of reassurance that I was in the right hands. Not only was he thorough in explaining the process, but he made it absolutely clear that he wants nothing but the best results for his patients and that he would take the extra steps and time, if necessary, to make that possible. Dr. Jafari's expertise comes through almost immediately by his level of knowledge, genuine care and professionalism that he displays. His office and staff are nothing but the best, and I would invite anyone in need of a good endodontist to make an appointment with him."